If there’s any validity toÂ this competition, that would be the headline at the end. Alas, that’s not going to happen, so we will announce the real winner now. 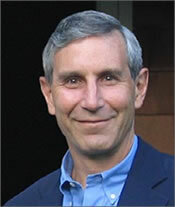 AllÂ other PR bloggers are nibbling at the edges, Richard Edelman is square in the center, week after week, post after post.Â He deserves recognition for the most important, insightful, useful and consistent blog focusing on public relations. When Richard startedÂ 6 AM four years ago “blog” was still a new term. As the namesake of the world’s largest independent PR firm,Â he was a visible and vociferous proponent of social media and the “new” PR. He staked his ground early with “Pioneer Thinking” and Edelman flourished because of it. Along the way Edelman made some very public mistakes; theyÂ were also taking the biggest risks. Through the mistakes, apologies and corrections, we all learned. Look at 6 AM now and you see a series of posts that offer valuable, high-level information on media trends, usually based on a breakfast or dinner Richard had with an executive most of us could never access. We also get his personal side: His post aboutÂ visiting aÂ Nazi concentration camp is moving, the post about his sister Renee is touching, the piece about catching the Allman Brothers at the Beacon is funny.